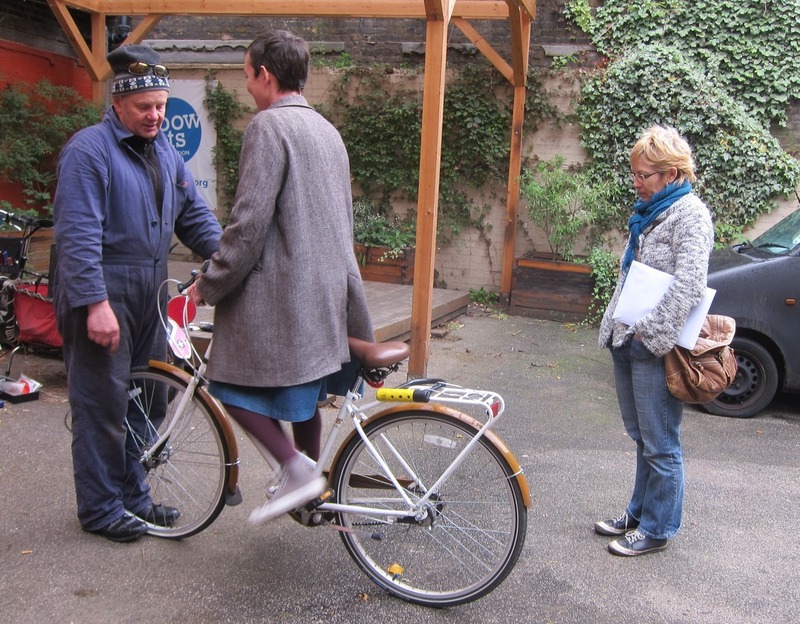 An area of focus in our environmental policy is staff, artist and audience travel, and one of the more sustainable ways of getting around is on a bike. 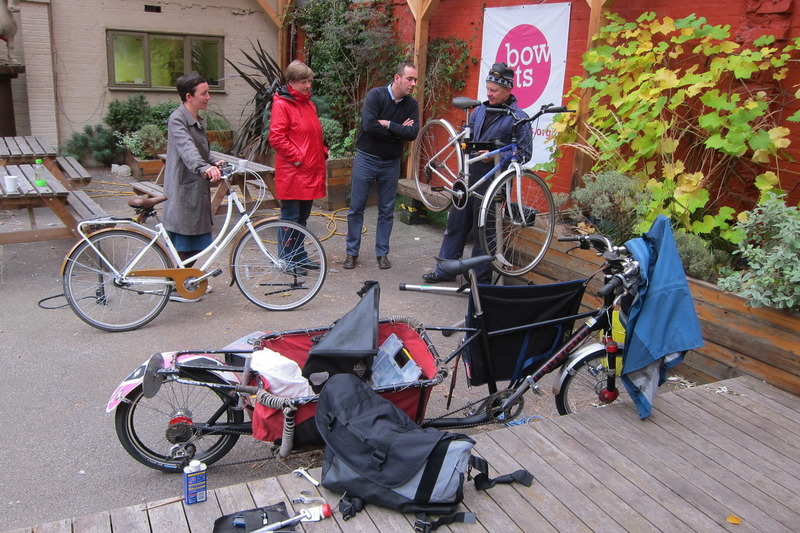 So as part of our Energy Awareness Campaign, the Green Team decided to host a cycle surgery for the Bow Arts team to promote the art of cycling and bike maintenance. Now, our staff are already quite good on the two-wheels front; the whole education team are regular cyclists with other members of staff not adverse to getting on a bike from time to time. Our CEO, Marcel, recently invested in a track pump and puncture repair kit for the Bow Road office and we even have a Bow Arts bike for staff use. But we know that there’s always room for improvement. 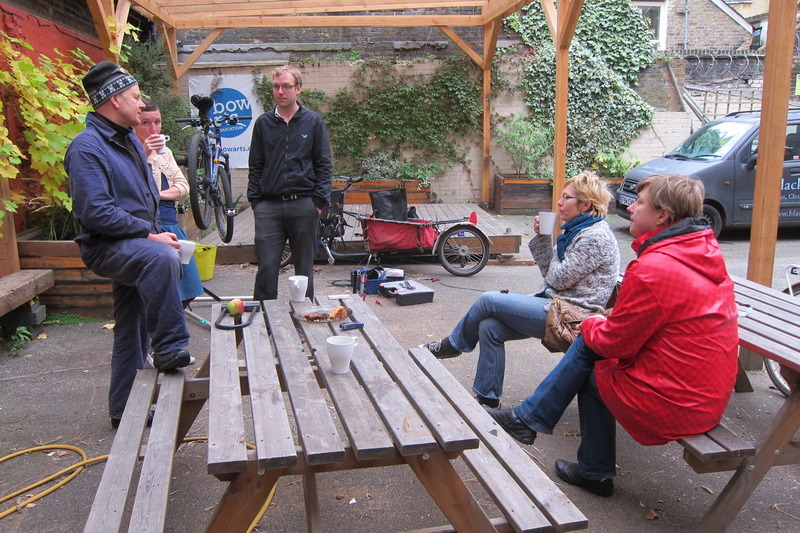 And so to enable our bikes to get some attention before the winter weather bites and to demystify their mechanics a little, we invited Patrick Field, London School of Cycling founder and Own the Road blogger, to our Bow Road courtyard for a couple of hours last Friday lunchtime. 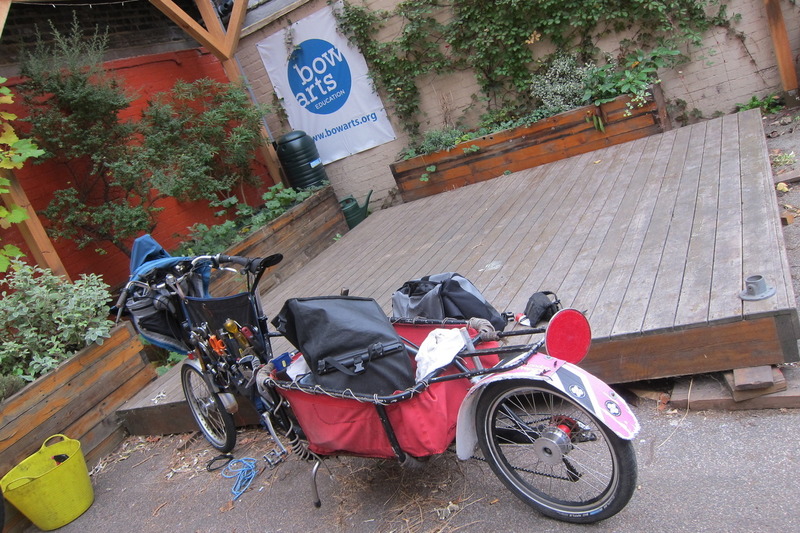 Patrick arrived in style on his 8Freight and soon set up a temporary workshop under our pergola. Over the next few hours he saw a steady stream of bikes and their owners and proceeded to repair punctures, fix brakes, tweak cables and tighten and loosen various screws. 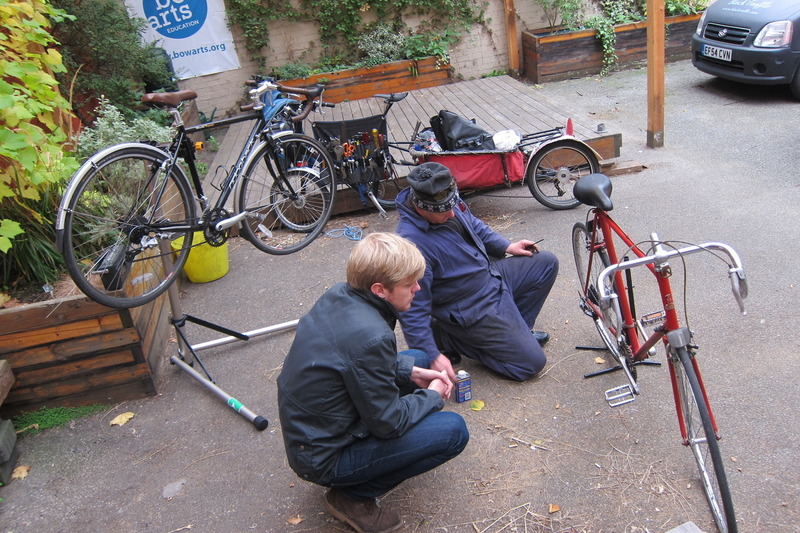 And the Bow Arts bike, re-christened the orphan bike, received some much needed attention, ensuring it’s roadworthy for another day. But Patrick didn’t only patch up bikes, he explained exactly what he was doing to an engaged audience, equipping them with knowledge in order to maintain their own machines. Top tips included cleaning your bike before you take it to the shop so the mechanic knows you care about it, therefore taking you more seriously, and the importance of regularly checking for chain wear and keeping it clean and lubricated. 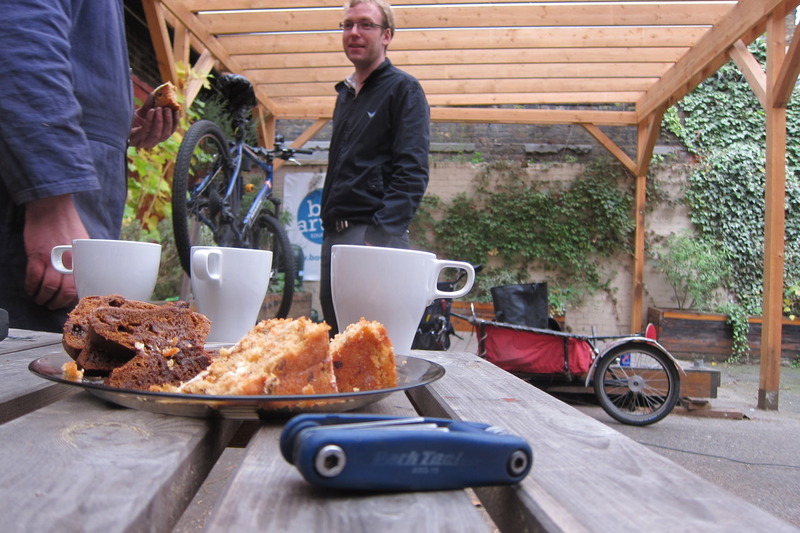 We rounded off the afternoon with a general chat about bikes and cycling, accompanied by the requisite tea and cake, and Patrick kindly stayed on to fix a rogue puncture. You can check out photosfrom the surgery, and see Patrick’s 8Freight, in the post below. For more of Patrick’s advice, visit Made Good Bikes, which includes a free and extensive online cycling repair manual starring Patrick.